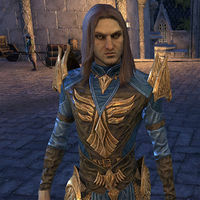 Justiciar Tanorian is an Altmer member of the Divine Prosecution under Chief Justiciar Carawen who, along with Justiciar Farowel, issues contracts to deputized visitors from the Divine Prosecution station located in Rinmawen's Plaza in Alinor. He issues contracts that involve delves while Justiciar Farowel sends you to world bosses. "Ah, another newcomer! Would you possibly be interested in helping the Divine Prosecution? We need assistance with a sudden abundance of investigations and you seem perfect for the task. Compensation is generous, of course. What do you say?" "Ah, there you are. I see you've been deputized by Chief Justiciar Carawen. It's quite exciting to see so many newcomer taking an interest in our little project. Now, I expect you're ready for your first assignment." "The labors of the Divine Prosecution mount, but our ranks remain annoyingly low. That's why we need the help of deputized newcomers such as yourself. Are you ready for a contract?" "I could never imagine the newcomers would be this helpful to the Divine Prosecution's efforts! It's simply astonishing." "Are you ready for a contract? I'm sure a newcomer such as yourself has plenty of time to spare for a worthy endeavor." "The Divine Prosecution never rests, so long as there's malevolent forces set to defile our beloved island!" "The Divine Prosecution provides protection for all, even newcomers. But even we need help, what with all the incidents springing up around the island. Care to take on a contract?" "Ah, to be free of all responsibility. A terrifying thought, truth be told. Let's get you a contract and give you some purpose!" "The labors of the Divine Prosecution mount, but our ranks remain annoyingly low. That's why we need the help of newcomers like yourself. Are you ready for a contract?" I'd like to take an assignment. "The Divine Prosecution always appreciates those willing to risk life and limb for the citizens of Summerset." "I do believe you'll need to leave the area if you actually want to complete the contract I gave you." "I thought the contract was self-explanatory. Do you require more information or did you just want to chat before you completed your assigned task?" "Remember, the Divine Prosecution placed a great deal of trust in you with this assignment! We wouldn't want to give newcomers a bad name, so go out and get it done." "The Divine Prosecution doesn't pay until the contract is complete. So get back to it!" "Greetings, deputy. Were you able to complete your assignment?" Tell me about the Divine Prosecution. "The Divine Prosecution enforces both secular and religious law. We're charged with maintaining the moral integrity of the entire island. As such, we conduct many different types of investigations, including those that deal with Daedra." Does Summerset have a Daedra problem? "Of course not! Some wrong-thinking Altmer sometimes gets a heretical idea and says an inappropriate prayer or joins a half-hearted cult, but this is Summerset! To be honest, most of our real problems center around newcomers to our fair isle." So what does the Divine Prosecution actually do? "We represent law and order in Summerset. As such, we investigate crimes of all sorts of legal infractions. We're lawkeepers and protectors of religious and social mores. Due to the sudden uptick in incidents, we've been forced to seek outside help." Does it bother you that the Divine Prosecution needs outside help? / Does it bother you to seek outside help? "Not in the least. After all, I was the one who suggested the idea to the High Magistrate. In my experience, newcomers are well-suited to the incidents we need to contract out." Why do you think newcomers are well-suited for these tasks? "In Summerset, every native-born Altmer has a place and purpose. Everyone has their hands full just trying to stay on the Path to Alaxon -the path to perfection. But newcomers, they're just brimming with idleness and the need for a purpose." "We've got another invasive species making their homes here on Summerset and disrupting the natural order! It's the reef vipers this time. Vicious vermin. I have reports that they're breeding in record numbers out in Wasten Coraldale." You want their numbers culled? "Yes, indeed! The Sea Elves regularly goad their nasty pets into our water ways. If left unchecked they'll devastate the local fauna and move on to do it all again. We need to root out these nests before the vipers spread to the mainland coast." How much of a threat are reef vipers? "Wild reef vipers are large, toothy ambush predators. Dangerous, but easily taken by a skilled hunter. It's the ones the Sea Elves train as pets that you'll need to worry about, but there's slim chance finding one of those." What makes Sea Elf vipers so bad? "They breed them to be bigger, smarter, and nastier than their wild kin. Obedient as any war hound and ten times as dangerous, at least! There have to be Sea Elves around for you to encounter some, so no need to worry yourself about them." Why don't you think I'll encounter Sea Elf vipers? "There would have to be Sea Elves, for one, and there's nothing of interest to them in Wasten Coraldale, except maybe some leisure fishing. Once you've handled the viper nests, you should try some angling. It's good biting season in those parts." I've destroyed the reef viper nests. "Fantastic! One less unwanted nuisance to worry about on our fair shores. Thank you for your contribution to keeping our home pure." "The cult of Phynaster has petitioned us to recover articles of faith from King's Haven Pass, so they may pay proper respects to their pilgrims lost there. Very significant work, just not pressing...so perfect for you!" Could any of these pilgrims still be alive? "No. They're assuredly dead. King's Haven Pass is very dangerous, teeming with goblins and gryphons, but the cult considers the pilgrimage a test of faith. Recovering their articles would be viewed favorably by the religious authorities." I'll recover the pilgrims' articles of faith. What's the significance of these religious articles I'm supposed to recover? "The items you're recovering are devotional, but also very personal. Objects with a deep spiritual connection to the departed. Through them the priests will bless the fallen pilgrims' souls on their journey." So they're meant for some sort of ritual? / And the pilgrims' articles of faith are meant for some kind of ritual? "Of sorts. There will be a ceremony, but perhaps significance would have been a better choice of words. It'll bring proper closure, for the departed and the survived." Is it common for pilgrims to die like this? "Every year there are a few who never complete their pilgrimage, but lately it's become a much more common occurrence. Patrols that would hold the goblins and beasts in check aren't a priority in these troubled times." I've recovered articles of faith from pilgrims in King's Haven Pass. "That's a very meaningful gesture from a newcomer. The Office of Divine Prosecution will have to handle their official return, of course, to preserve the integrity of the fallen, but I'm sure the families will be grateful for their return." "The Divine Prosecution has been following the Sagacians for quite some time, a group of researchers who are truly no better than bandits. We've discovered that they are currently holed up in the ruins of Tor-Hame-Khard." "They've stolen many valuable relics, and we need you to recover them. We also wish to keep tabs on their movements. I suspect most of the Sagacians have written plans on their person. Collect those plans using any means necessary." "A group of scholars who found the laws of Summerset to hold too many limitations. They've abandoned all scruples, researching dangers that are best left forgotten or destroyed. They'll use any means to obtain their dark ends." "Thievery is quite common. We've gotten a flood of reports in the last year alone of missing relics, all tied to this one organization. They've also begun bribing government officials, though we've no leads yet on who." And why are they in Tor-Hame-Khard? "They're most likely conducting experiments of some kind. Honestly, this isn't the first time a dangerous party has taken over Tor-Hame-Khard. I've often found that secluded ruins attract that sort of attention." I've recovered the relics from the Sagacians. "And collected the plans as well! Very good. These will be useful for tracking their movements. As soon as we have the resources, we'll rid Summerset of this filth, once and for all. I thank you for your service. Live well and serve, deputy." What's important about the Rose-of-Archon? "To understand that, you must know the legend of Nenamil, Archon of Song. He was an orphan and poet, and would often sing of the beauty of Mara. He felt that he could feel no greater love than that of the Goddess who was mother to all creation." How is he connected to the rose? "Nenamil wished for nothing more than to see Mara herself. He searched all of Summerset, visiting holy sites and seeking rumors of her presence. Then one day he came upon the most exquisite flowers, beautiful roses that seemed to shine in the light." "He realized the truth. Mara wasn't a mere being, but rather beauty itself. Her goodness was in all exquisite things, such as the rose he had found. He dedicated his life to teaching that. His rose has been used to honor Mara ever since." "We've been gathering reports of a Meridia cult for years, but only recently were we able to find them in Eton Nir Grotto. However, it seems that their worship attracted the attention of Daedra. Most of the cultists, if not all, are dead." "We've gotten some troubling reports of the Daedra creating cocoons. There's dozens of them now, spreading throughout the cavern. We need you to destroy them. Oh, and burn any sacrilegious text you find. No need for that material to remain." I'll destroy the Daedra's cocoons and burn any sacrilegious text I find. What exactly happened to the Cult of Meridia? "While I'm not privy on the exact details, speculation is hardly necessary. I suspect that their Daedric worship attracted dark forces. Divine retribution, if you will. It's simply not worth our resources to investigate." What exactly are the cocoons I have to destroy? / Right. Can you tell me more about the cocoons I have to destory [sic]? "We noticed these cocoons during our first scouting mission, glowing malevolently. Since then, they seem to have increased in number. You don't have to be a Daedrologist to sight the potential danger." "We're not exactly sure. It could be a summoning ritual of some sort, perhaps even a method to breed. Given time, I'm sure these cocoons will bring forth nothing but ill intent. It's up to you to destroy them, for the good of all." Why do you need me to destroy sacrilegious texts? / And why do you need me to destroy the cult's texts? "Why do I...? My, what an odd question. These texts are meant to spread misinformation about the so-called benefits of Daedric worship. To destroy them would be to protect the moral integrity of Summerset's citizens." So Summerset citizens aren't allowed to read about Daedric worship? "Wisdom gained through tainted words can hardly be called wisdom at all. Why allow this filth to clutter the minds of good mer? I'm afraid a newcomer just wouldn't be able to understand." "Excellent! The furnace is the only suitable place for any Daedric scripture. And destroying those cocoons should put an end to those Daedras' dark machinations. You've done Summerset a great service, deputy. And so quickly too! My!" "We've seen a precipitous rise in the sale and exchange of forbidden books. And not just the coarse literature from the mainland. I'm talking about something dangerous—Worm Cult tomes. So you want me to track down the books? You'll find him in Golden Gryphon—at the bar, no doubt." Tell me about your colleague. "Sorry if I seem cagey. Members of the Psijic Order value their privacy - Esulo most of all. You'll find that he is always quite ... engaged, and doesn't like to be disturbed. That said, he's been invaluable in tracking down the Worm King's books." How did you make contact with a Psijic mage? "He made contact with me. I thought it odd, given my junior position in the Prosecution, but he was very insistent. He said I was perfect because I am pliable and eager to please. Back-handed compliments, but compliments nonetheless!"